In San Prospero, in the province of Modena, the Barbieri family produces a sublime condiment labelled Traditional Balsamic Vinegar of Modena, which has obtained a Protected Designation of Origin and requires years of ageing in wood. The balsamic vinegar of Modena was quite reputed within the European aristocracy in the middle ages and its popularity only increased during the Renaissance. For centuries balsamic vinegar was home produced for self-consumption. It debuted on the marker only after the second world war, when it became common practice to buy century-old barrels and put them back into use. Eugenio Barbieri and Loris Bellei were the forerunners of the process of revival and popularisation of the Traditional Balsamic Vinegar of Modena. 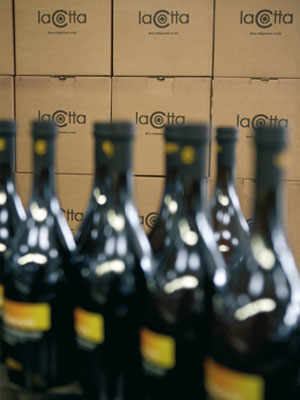 Their successors Gilberto and Erika Barbieri (Eugenio’s), along with Daniele Bonfatti (Loris’s), are the incumbent owners of the Acetaia del Cristo, in San Prospero, province of Modena. 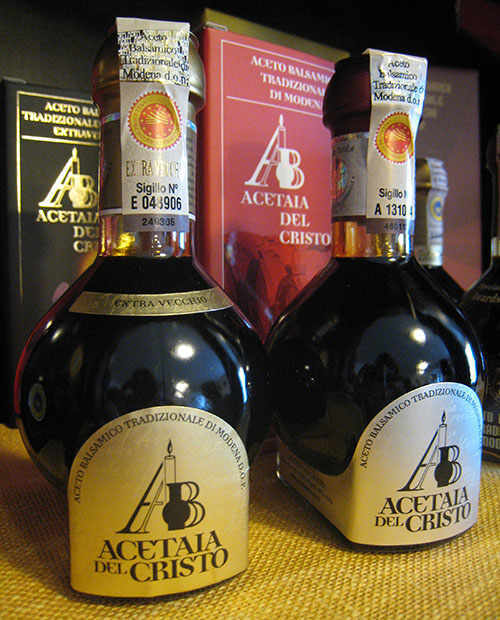 At the Acetaia del Cristo, the vinegar is obtained from the grapes grown organically on the back of the homestead. The must, after being fermented in the cellars, is poured into the so-called badesse, the largest casks in the farm, in which the acetic acid bacteria convert ethanol to acetic acid in the presence of oxygen. Early in spring, the must is transferred into a series of smaller century-old casks, named vaselli, where ripening and ageing occur. 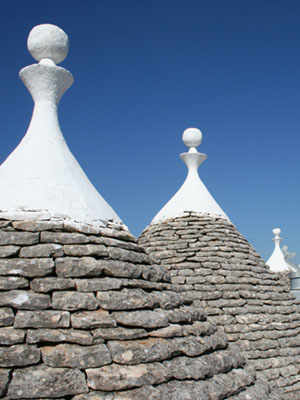 Each series consists of 5 to 12 wooden casks of decreasing size. 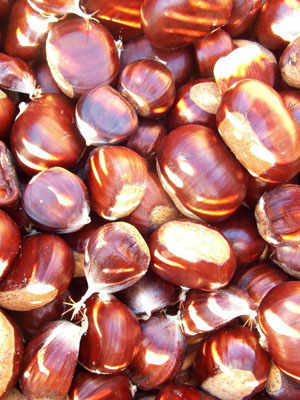 The material may be oak, chestnut, mulberry, juniper, cherry, acacia or ash wood. Each barrel is filled up to 75% of its total volume, so as to leave a large portion of the must surface in contact with the air, in order to favour the microbiologic and enzymatic activities and improve the concentration of the product by means of evaporation. The Traditional Balsamic Vinegar of Modena must be left to age for at least twelve years, during which time it is meticulously decanted to different casks of progressively smaller sizes and topped off. 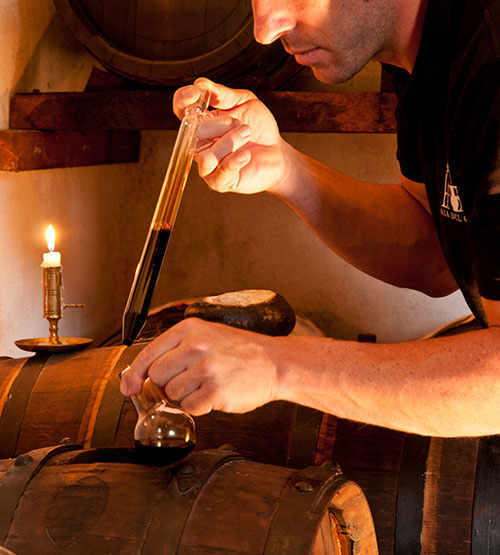 The Traditional Balsamic Vinegar of Modena is obtained from the smallest cask. 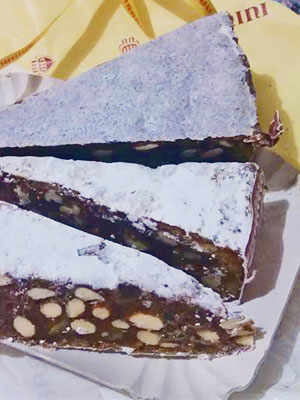 The Extra-Old kind requires 25 years of ageing. Decanting must not exceed 10% of the content of the smaller cask. The missing quantity is topped off with the content of the next larger cask. The final product is sent to the Consortium for the Protection of the Traditional Balsamic Vinegar of Modena, where chemical and organoleptic tests are carried out. Upon passing the tests, the vinegar is bottled with the presence of the producer.